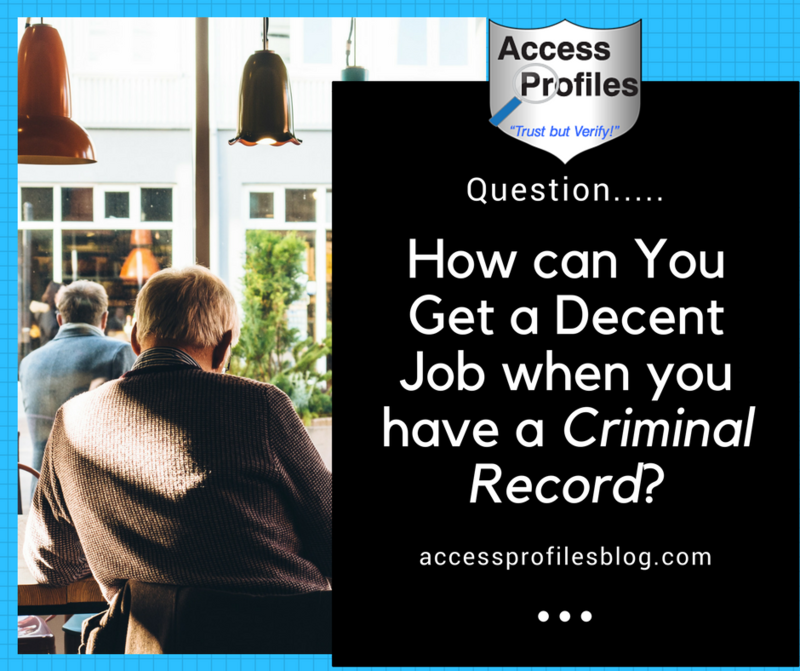 Access Profiles, Inc.: How Do You get a Decent Job with a Criminal Record? How Do You get a Decent Job with a Criminal Record? Can You Get a Decent Job if You have a Criminal Record? This question has been asked often and is a valid concern of anyone who has a past criminal history. So, when it came up again recently on quora.com (a Question and Answer site), I thought I would share my answer in hopes of helping others who are asking the same question. "It can seem very daunting landing a job when you have a past criminal history. However, there are things you can do to make yourself more employable. First, Get a job, any job. It may be fast food. It may be janitorial. It doesn’t matter. The key is to work hard, be on time, be productive, and be eager to learn. Your employers will notice. Then, when you are ready to move on, you will have demonstrated a good work ethic and reliability. This will lead to a good reference. You may have to do this multiple times before a company who is offering a “decent job” will take a chance on you. Another route is to find local companies who do hire those with criminal records. Believe me, they are out there. Then you need to do the same thing. Work hard and be a model employee. Each time, you will be building your resume and your reputation. This is key. Even then, there will be employers who are hesitant about hiring you. That is when you need to be ready to plead your case. Emphasize how you have moved beyond your criminal past. Focus on what you have done to better yourself. Have a list of references ready who are willing to stand up for you, especially past employers who know of your good work and behavior. This is the best route to changing your life and becoming employed. I wish you luck!". You can find more answers to this question here. There is no doubt that having a criminal history does not make finding a job easy. Employers can be understandably leery about hiring you. They may be concerned about you re-offending or even you posing a problem for their business, their customers, or their other employees. You have to recognize this and understand that business owners and managers have a right to be reticent about hiring someone with a criminal past. Their very livelihood and reputation is on the line. However, having a criminal record does not mean you are unemployable or destined to only the lowest paying jobs. 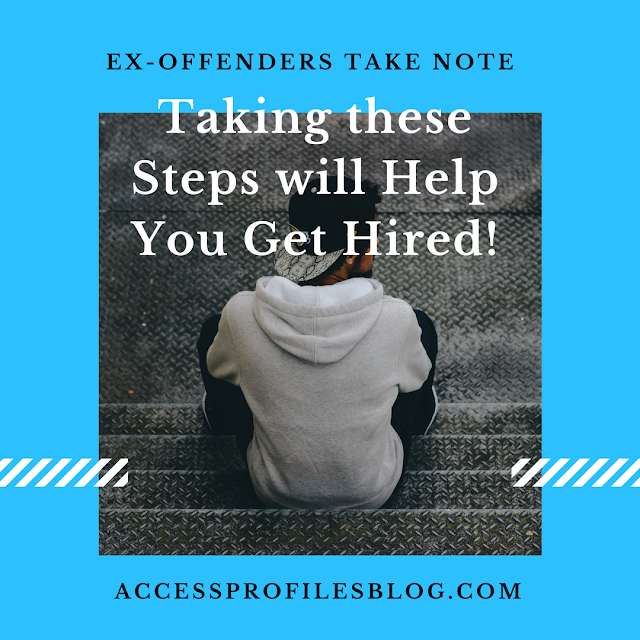 Ex-Offenders take Note ~ These Steps will Help You Get Hired! “Tweet This”! As I shared in my Quora answer, there are definitely steps you can take to increase your chances of being hired and, eventually, landing the “decent” or better jobs you need. 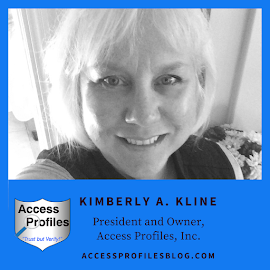 “It is important to note that not all employers will automatically eliminate you from consideration if you have a criminal record. EEOC guidelines actually recommend that employers only take into account offenses that directly pertain to the job. Be ready to plead your own case. Own your criminal past, share any circumstances that lead to your conviction, and show what you have done since them to turn your life around”. Find our more advice in “Job Seekers’ Top 5 Frequently Asked Background Check Questions”. But that does not mean finding a decent job will be easy. “In this challenging job market, many ex-offenders feel like they don't stand a chance against job seekers with clean records. That is why it is important that you deal with your criminal record head on”! And this can mean self-disclosing your criminal past! Understandably, this is one of the most common areas of concern for ex-offenders. “Take responsibility and be ready to explain any circumstances that lead to you committing your crime(s). When you are truthful, it is much more likely that the employer will put your past in context. While sharing this personal information may be difficult, it can go a long way towards getting you a second chance and showing you have moved on”. Excerpts above from “Job Seekers: Do You have a Criminal Record? Find out the Best Time for You to Tell Your New Employer!”. You also need to take care how you perform when given the chance! As I mentioned in my Quora answer, it is important to work hard at any job you are given. Make sure you are always on time, or even better, early. Treat your co-workers and managers with respect. Be polite to customers. In other words, do what you can to stand out! This will go a long way towards putting you on the right path the get the kind of job you need. Having a criminal past does not have to ruin the rest of your life. The key is to be willing to put in the work to overcome the stigma associated with ex-offenders. And remember, there are employers out there who are willing to give you a chance. While finding a decent job will most likely not come quickly, each step you take forward helps bring you closer to your goal. Looking for a Job? Contact Us! 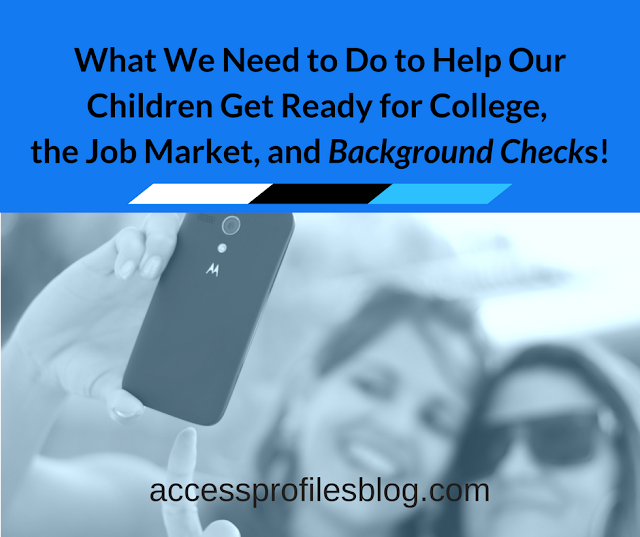 We can help you get your resume “background check ready”.